Everyone has an odd quirk, some strange food or combination of foods they really, really enjoy that might make others squeamish. Sometimes it’s just something that makes people scratch their heads and wonder. Other times it’s a true “you have GOT to be kidding me” sort of thing. I feel this way about my husband’s “dream team” sandwich of salami, American cheese, and peanut butter. Makes no sense to me whatsoever. The food I eat that does the same for him? Pimento cheese. I seriously dig on a good Cheddar-based PC. Not the stuff you get at the grocery store that’s a mixture of pasteurized processed foodstuff with a few red flakes in it, but the sort of thing that a home cook has actually put together in their own kitchen with a big spoon and that little jar of red pimentos that’s about the size of a baby food canister from the store. Hard to find a good pimento cheese sandwich around these parts. 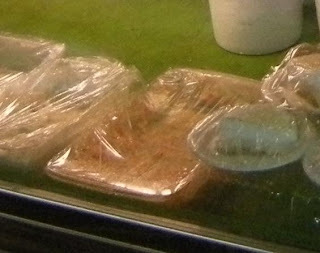 Forget about anything you might find in a truck stop; anyone brave enough to eat a truck stop pimento cheese sandwich had better have a lead-lined stomach. For a short while, St. Vincent’s had one in their cafeteria, but like so much of the good stuff that used to be served their it’s gone (they still do a mean Reuben, though). 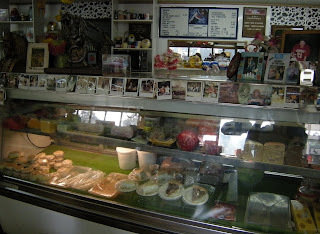 A few weeks ago, I did stop in at the one place I knew that still did good pimento cheese -- a little place out in the boonies (re: south of Sheridan) that caters to the hunting and fishing crowd. Gibb’s is a combination of sports stop, convenience store, restaurant, and bragging post. It’s the kind of place where old men go to brag about how many points were on that big deer they bagged 20 years ago, where people lie about fish. Where you expect the customers to have dirt under their nails from digging up their own worms in the backyard. The walls are adorned with year after year after year of Polaroids of people and their scores -- the bucks draped across the back of a truck brought in for tagging and that notch on the license plate -- generally in the same pose with the guy or girl who bagged their buck holding its head up by the antlers for that snapshot in time. The pictures on some of the walls are so old, teenagers in the shots are now grandparents. It’s a great little stopping-in joint, and about the last good place to pull in before you get down to Fordyce. There’s a counter there, and lunch specials and lunchmeat… and almost always on the bottom of the case there’s an oblong casserole dish full of pimento cheese. A sandwich costs a couple of bucks, but load me up with that and a container of chocolate milk from the case and I’m off to nostalgia-ville. 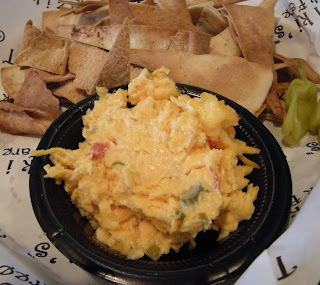 The pimento cheese from Gibb’s is very much on the tangy side, and I wouldn’t be surprised if their mayo-based concoction is laced with the juice from those pimentos as well as the little red slivers of happiness. You know, when I was a small child, I didn’t realize that pimentos were actually slivers of a variety of red chile pepper? I thought olives actually came that way, with little red centers. I think I was a teenager before I realized that olives came with hard pits. 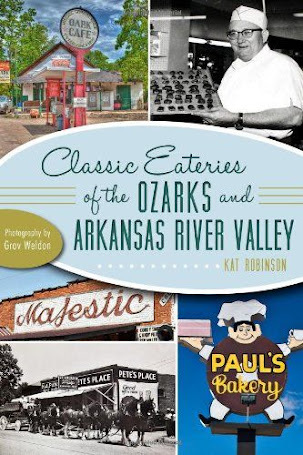 That’d be almost unheard of today… but you gotta remember, the culinary world as we know it didn’t really exist in Arkansas back in the 70s and 80s, not for most of us. It’s a recent phenomenon, this pedestrianization of haute cuisine. But I digress. What got me on to thinking about pimento cheese was an encounter with a variety that I daresay rivals my mom’s mix, in a somewhat unlikely place. 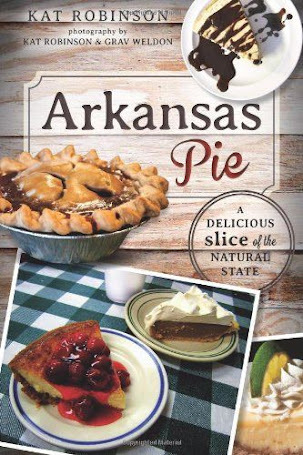 Pimento cheese, that stalwart of lunchboxes and fishing trip coolers, that most humble of Arkansas delights? Can be found at a Greek fare restaurant. That’s right… you can find pimento cheese at Tazikis, the fashionable (and not too expensive) Greek place on Cantrell across from Pavilion in the Park. Right there, right along with hummus and taziki sauce, is pimento cheese. As a dip. Further down the page, it’s a sandwich, served on toasted buttermilk bread with Romaine lettuce. There’s even an offering of take-home pimento cheese by the pound or half-pound. I discovered this one evening when I and a few of my traveling companions went to the eatery for a knosh. Lamb was ordered -- one chose the Sliced Chargrilled Leg of Lamb ($9.25) “Greek Feast,” while the other went for the Greek Surf and Turf ($12.25). I decided on my own light lamb dish and went for the Taziki’s Roasted Lamb in Fresh Pita ($7.95)… but I was also curious about the pimento cheese ($4.50) so I ordered it as an appetizer. Since it was paired with dips, I expected it to be more like a dip. Instead, moments after I’d placed my order at the counter, a more-than-sufficient bowl of pimento cheese was brought out to us, along with a healthy pile of baked pita chips and Kalamata olives. My traveling companions shied away from such a pedestrian dish, but I nervously tried it. 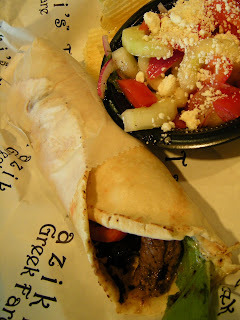 And I have to say, though my lamb gyro was awful good, I would have been as happy as a dead pig in the sunshine with just that order of pimento cheese. It put me in a happy place. The Cheddar cheese was slightly sharp, and the pimentos were plentiful, and even better there were chunks of green olive, too. It’s the closest anyone’s come to my mom’s recipe. The rest of our Taziki’s fare was pretty darn good, too… the lamb still pink in the middle but charred beautifully and delightfully seasoned. The shrimp was just cooked past the point of not being done at all, perfect mouthfeel and salty in its seasoning. The tomato-cucumber salad is reminiscent of Star of India’s Kachumber Salad but with Parmesan cheese instead of garam masala and other spices, vinegary and tinged with slivers of red onion. 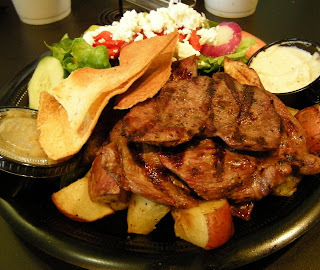 Dinners come with a Greek salad and a choice of roasted potatoes or Basmati rice… gyros with potato chips and a choice of the tomato-cucumber salad, the potatoes or rice, a pasta salad or fresh fruit. I know it sounds crazy to talk about a single, simple dish from a restaurant so much, especially when it’s something so… humble. But it really impressed me, and even if I hadn’t liked anything else there I’d be going back for more of a childhood favorite. 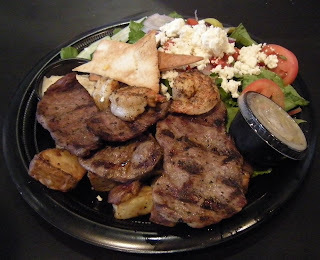 You’ll find Taziki’s Greek Fare at 8200 Cantrell Road in Little Rock. I understand they’re a chain but that all the other locations are in Alabama, how about that. 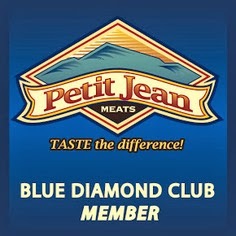 They have a website and are open from 11 a.m. for lunch every day, and dinner every day except Sunday. (501) 227-8291. And in case you’re curious, you can find Gibb’s Grocery and Hunters Outpost at 7781 Highway 167 South, about six miles south of Sheridan. It could be the busiest place in the world on the opening day of modern gun deer season in Arkansas, but that’s another story. You can also call if you like -- (870) 942-5284. 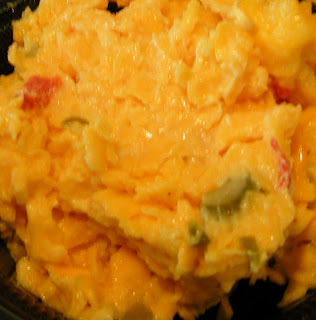 I never ate pimento cheese as a kid because Mom always bought it and I was rather put off by something (not sure what). Probably the only cheese dish I ever turned down. Then I had a homemade version that sounds like your Mom's. Loved it. There is a company that makes it for Whole Foods and they make smoked gouda and jalapeno, among other flavors. They are *wonderful*. I can't remember the brand, but they're in the cooler by the salad bar. Pimento cheese equals comfort food for me. Homemade is best... sharp cheddar is a must. But the previous comment has it right with the jalapeno version, though I've only purchased it from Fresh Market (with some crusty bread...mmmmmmm!) 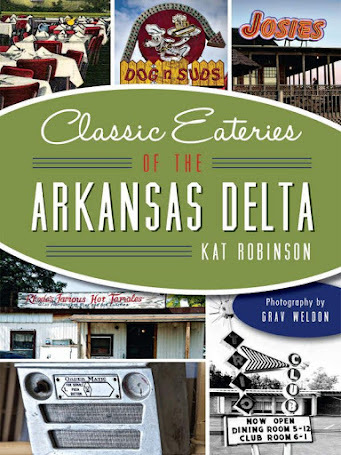 I believe Dizzy's in Benton offers a sandwich, as well. 1) Really? It's spelled 'knosh'? I'm been using 'nosh' this whole time.. silly me. Pimentos are roasted red bell peppers. Actually, pimientos are cherry peppers, not red bells. Gave Taziki's another chance. (First time was take-out that did not get eaten very timely and the lamb was tough.) Absolutely loved the pimento cheese. Had the egg and olive sandwich and tomato cucumber salad. Both were wonderful. Companion had the grilled eggplant sandwich and loved every bite. Service was unbelievably quick for lunch rush on a Friday. One more pimento cheese purveyor would be Meador Pharmacy in downtown Dumas. It's an old-time soda fountain atmosphere, and the pimento cheese has something of a local following. Burgers are great at the Wagon Wheel. Seal the deal at The Villa. New Kid In Town - The House off Kavanaugh. 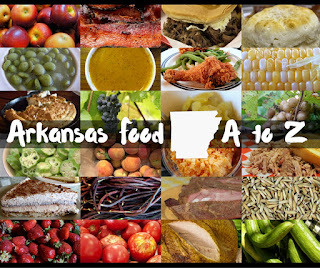 Brand New Thing - The Argenta Foodie Festival.